Welcome to the WI District 4 LL Homepage! This is the home of Little League baseball in south-central Wisconsin. The most updated and recent informaion, including District and State tournament schedules, scores, and standings can be found on our Facebook page. To find us on Facebook, simply search "Wisconsin District 4 Little League." Once you are there, be sure to "Like" us! Also, please use our Facebook page to post comments and pictures about your local leagues and/or the district tournaments. Get the word out about all the great things happening in District 4 Little League! In the future we may discontinue use of this website in favor of the Facebook page. If you have a comment about this, please send an e-mail to jjkautza@hotmail.com. 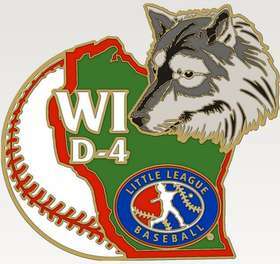 Wisconsin District 4 Little League is now on Facebook! Simply search for Wisconsin District 4 Little League on Facebook and you should find our page. Please feel free to use the page to post comments and pictures of anything newsworthy from your local leagues. And for post-season tournaments it will be a great place for you to share your thoughts and photos of your favorite players. Gone are the days of having to email me your photos for the website. You can now share them with everyone! Please visit the page and be sure to "like" us. You will then receive updates which will be very useful (especially during tournament season!). We hope you enjoy the added functionality of our facebook page. Go like us now!